Vivek Agrawal, MD — Dr. Agrawal is director of The Shoulder Center in Zionsville, Ind., which specializes in providing advanced care for shoulder problems. Recent reports in the media show that many healthcare practices are losing money in this struggling economy. However, many orthopedic and spine practices have managed to implement initiatives that have helped them to maintain profits. Proliance Surgeons (Seattle). Proliance Surgeons is one of the largest surgical practices in the country, with 160 physicians specializing in orthopedics, ENT and general surgery. The surgery practice features 100 orthopedic surgeons who treat patients at a number of hospitals and 13 outpatient surgery centers owned by Proliance surgeons. 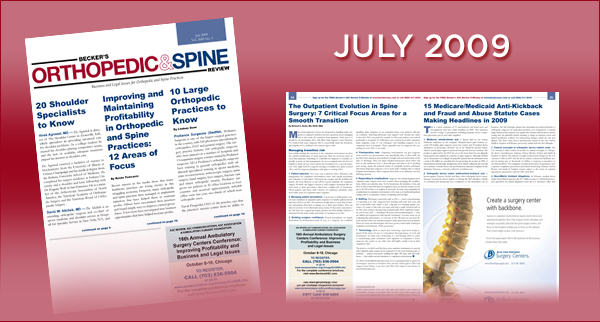 Bruce McCormack, MD, a neurosurgeon and spine specialist who practices in San Francisco, suggests the following five steps to build a successful spine surgery practice. 1. Orthopedics was fourth among identified specialties represented at single-specialty centers, tied with pain management, and was represented in 5 percent of all single-specialty ASCs. The number of Americans enrolled in health plans with high deductibles is on the rise and is expected to continue as employers look for ways to cut costs in this tough economy. This trend creates challenges for practices as they begin to see more and more patients who are responsible for significant out-of-pocket expenses for treatment. Here are 10 interesting statistics about surgery centers with greater than 50 percent of their case volume in orthopedics, from the VMG Health 2008 Intellimarker. Keith Pitchford, DO, 48, an orthopedic surgeon specializing in sports medicine, is the president and CEO of Great Lakes Orthopedics & Sports Medicine in St. John, Ind., and is the medical director for the Sports Medicine Institute in Crown Point, Ind., a joint venture athletic training, treatment and rehabilitation center with St. Anthony Medical Center in Crown Point. Aleksandar Curcin, MD, was born in Novi Sad in the former Yugoslavia and eventually made his way to the East Coast where he studied medicine at the University of Maryland. He performed his orthopedic residency at Brown University in Providence, R.I., and spine training at the University of Maryland, where he remained on the faculty for seven years at the University Maryland Shock and Trauma Institute. Many neurosurgeons I know are interested in handling spine surgeries at outpatient facilities, but have questions about managing risk as they make the transition from inpatient. This is a short summary of 15 anti-kickback and fraud cases and investigations that have made headlines in 2009. The situations involve a range of participants including hospitals, device companies, physicians, payors and other suppliers. Orthopedic practices are often very busy places, and keeping schedules orderly can present a challenge. Further complicating issues is the fact that many orthopedic surgeons receive patient referrals from local emergency rooms who must be added into their schedules, often at short notice.